The 2018 college football season is here, and ESPN’s popular weekly College GameDay TV show is ramping up for another season of Saturday morning football entertainment filled with information, analysis, statistics, features, and predictions valued by sports bettors and football fans. One of the engines that drives the show, both behind the scenes and on camera, is ESPN senior researcher Chris “The Bear” Fallica, a horseplayer who is making an increasingly big name for himself in another world where statistics, analysis, and predictions are useful to one’s success – horse handicapping tournaments on the NHC Tour. Chris Fallica has been ESPN’s top number-cruncher and information guru for many years, and as research producer for College GameDay, it is his job to provide the statistics, notes, and graphics that are so integral to the show’s presentation. When not traveling to campuses around the country during the football season, Fallica also finds time to apply his gift for numbers and statistics to his second love – the art of Thoroughbred handicapping. One would think that anyone so adept at numbers and statistics certainly would have skills that would fit well in the world of the National Horseplayers Championship [NHC], especially if that person also happened to be a horse racing fan. And that definitely is the case with Fallica, who has found that his pre-disposition for information-gathering translates well to success in handicapping contests. Fallica, 45, whose name is pronounced Fal-LEE-ca, has become a fixture in horse handicapping tournaments over the past several years. The Long Island, NY native has been going to the races since he was a kid when he’d join his father on outings to Belmont Park. While attending the University of Miami, he’d spend his free weekends going to Gulfstream, Calder, or Hialeah. Fallica joined ESPN in 1996 based at the worldwide headquarters in Bristol, Conn., and has worked there in several capacities over course of the past two decades. “The Bear” earned his first NHC qualifying berth in 2012 for the January 2013 finals of the NHC in Las Vegas. Six years later, Fallica is still going strong. 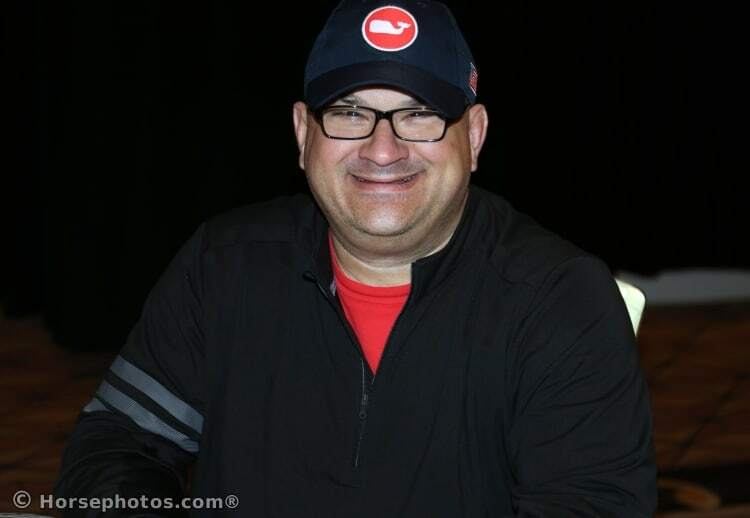 His big break this year came back on April 21 when he qualified for the 2019 NHC by finishing second in a contest against 140 entries at Horsetourneys.com, thanks in large part to his 23-1 shot Baby Bear, who won the day’s ninth race at Aqueduct. That longshot also helped Fallica earn a high placing in that day’s NHC Tour Free Contest. Dating back to 2013, Fallica has now won an NHC qualifying spot for seven straight years. The early-season April NHC qualifying success actually came none too soon for Fallica, who due to the time and travel demands of his job has only an abbreviated timeframe to work with when it comes to tournament play. He is really only able to concentrate on handicapping in the months before the college football season begins in late August, with the exception of some free Sundays and some time in December when the college football regular season has ended. While The Bear is still looking for his first chance to cash-in at the NHC – his highest placing to date was 72nd place in 2014 – his seven-year streak of qualifying into the NHC itself is enough to put him into exclusive company. The streak means a lot to Fallica, who actually has been around the handicapping tournament scene for quite a bit longer than the past seven years. It wasn’t for another 12 years that Fallica would finally get that elusive first NHC qualifying berth. Since then it has been a priority for him to get back into the NHC every year.